This week’s fossil comes from the Ediacara Hills in southern Australia. The so-called Ediacaran fauna are a strange set of multicellular organisms that date back, way back, to before the Cambrian “explosion” made famous by the Burgess Shale. The Ediacaran critters are about 560 million years old, which places them in the Ediacaran (also called Vendian) period of the Proterozoic Eon of the Pre-Cambrian Era. (Got that? If not, check out this detailed geologic time scale.) The point is: They’re very old. The question of what these fossils are is still not settled to everyone's satisfaction; at various times they have been considered algae, lichens, giant protozoans, or even a separate kingdom of life unrelated to anything living today. Some of these fossils are simple blobs that are hard to interpret and could represent almost anything. Some are most like cnidarians, worms, or soft-bodied relatives of the arthropods. Others are less easy to interpret and may belong to extinct phyla. I love it! A paleontological mystery right near the base of the animal tree of life. Museum of Comparative Zoology, Harvard University This particular fossil is Dickinsonia costata, which I have seen described as an early worm but also possibly a cnidarian polyp…or coral, turbellarian, mushroom, xenophyophoran protist, sea anemone, lichen, and even a close ancestor of the chordates. Once again: shrug. And once again: love it. 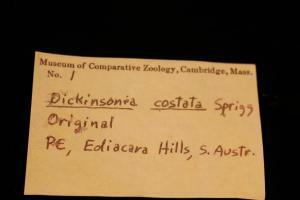 Congratulations to John Macdonnell who was first to correctly identify the genus and species. Bragging rights are yours, sir!